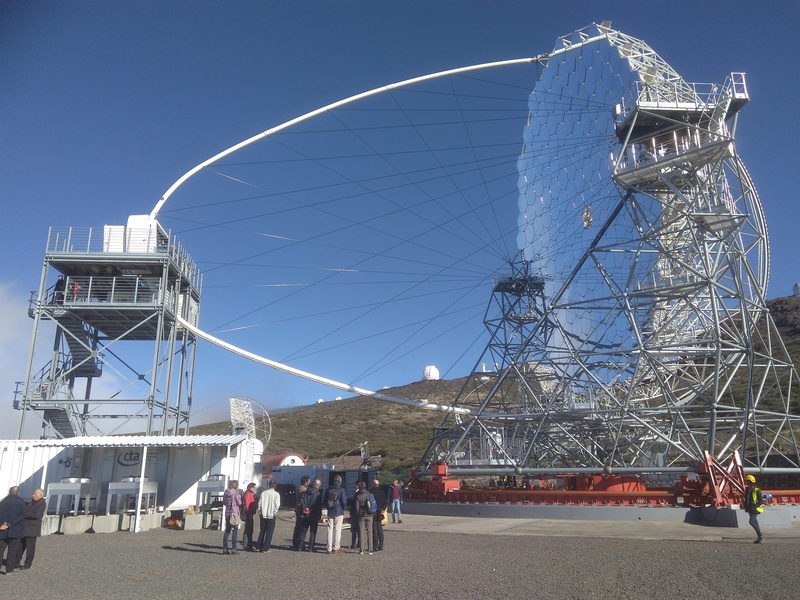 La Palma, 13th – 14th November 2018 – The 15th Council Meeting of CTAO (Cherenkov Telescope Array Observatory) was held on the Spanish Island of La Palma as La Palma will host the northern site thereof. 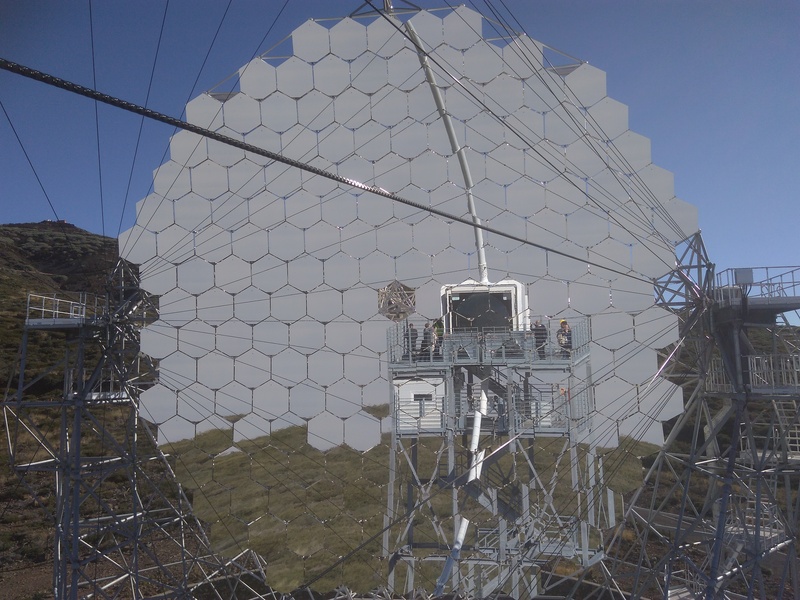 Recently, the 1st prototype of LST telescope (Large-Sized Telescope) was completed in the area. LST is a 45 m tall, 103 ton heavy telescope with a 23 m diameter mirror (reflective surface 400 m2), capable to point anywhere on the sky within 20 s.
The LST will serve for detection of gamma ray with energies 20 GeV – 3 TeV (mainly in the range 20 – 150 GeV). Northern site of CTAO will consist of 4 LSTs and 15 MSTs (Medium-Sized Telescope). Besides the visit of LST prototype participants of the Council Meeting had the opportunity to visit the nearby telescope GTC (Gran Telescopio Canarias) – one of the world´s largest optical telescope with a 10.4 diameter mirror. The contribution of the Czech Republic to the CTAO represents the telescope FRAM, recently installed and serving to monitor atmospheric conditions (namely aerosols and clouds) in the frame of CTAO. The “Pathfinder“ strategy was presented as a way forward – “Pathfinder“ will be a telescope that could become a part of the final observatory. Such telescope is built already on the CTAO ground, but is in the possession of its constructer until the acceptance of CTAO. The committee of independent experts was approved with the aim of design evaluation of SST (Small-Sized Telescope). There are currently 3 designs – single mirror telescope and 2 designs of double mirror telescopes. The Czech Republic, jointly with Swiss and Polish partners, takes part in the design and prototyping of single mirror telescope. Current CTAO Council Chair Gabriel Chardin was confirmed for a next term and German delegate to CTAO Council Markus Schleier was elected a Vice-Chair. Among other points on the agenda were the 2019 budget, information on the progress in negotiation with Chile about Southern site of CTAO; the questions concerning transition of assets after the CTAO ERIC establishment and possible scenarios of operational costs coverage were discussed as well. Next CTAO Council Meeting will be held in March 2019 in Bologna, Italy.